On the second day of Israeli Prime Minister Benjamin Netanyahu’s India visit, Prime Minister Narendra Modi held extensive talks with his counterpart at the Hyderabad House in New Delhi. India and Israel signed nine pacts today including in the strategic areas of defence, security and counter-terrorism. Terrorism from across the border has been the major security problem for India especially in Jammu and Kashmir. India’s external intelligence agency, the Research and Analysis Wing (RAW) has found it difficult to checkmate cross-border terror outfits and their operatives patronised by Pakistan’s Inter-Services Intelligence (ISI) at the source of origin. On the other hand, Israel’s special operations intelligence agency Mossad (meaning the Institute) has an expertise in neutralising terror operations at the source. An enhanced cooperation between Mossad and RAW in the sphere of security and counter-terror intelligence sharing will help India terror attacks like 26/11 and Uri. RAW came up in 1968 as a wing of the Intelligence Bureau following the failures in gathering advance information during 1962 India-China war and 1965-war with Pakistan. The then Prime Minister Indira Gandhi created RAW out of the IB under Rameshwar Nath Kao in 1968. India-Israel diplomatic relation was still in infancy given India’s policy of non-alignment despite having recognised the newly created nation way back in 1950. By the time of the creation of the RAW, both India and Israel were concerned over growing covert ties between Pakistan, China and North Korea. There were reports that Pakistan was training Iranians (1979 revolution was yet to take place) and Libyans with the help of the Chinese in handling of North Korean weapons in West Asia. In this background, Kao scripted a close cooperation with Israeli intelligence agency and RAW-Mossad liaison improved the diplomatic relations between the two countries. For almost 10 years since its creation, RAW remained a secret organisation to the world. Mossad-RAW collaboration worked fine for India and insiders say that many tasks were jointly accomplished without the world getting a whiff of it. Things took a surprising turn in 1977. Pakistan was getting assistance from France in developing its nuclear power plant at Chasma. It was publicly known. Pakistan was also working on a Uranium enrichment programme at Kahuta, secretly. One fine day the then Prime Minister Morarji Desai dialed Pakistan’s military general President Zia ul Haq and apparently said this: General, I know what you are up to in Kahuta. RAW has got me all the details. This gave out the official word on RAW. This also ended secret Mossad-RAW collaboration. Following Indira Gandhi’s assassination in 1984, RAW suddenly went out of favour in terms of financial support. With dwindling finances at disposal, RAW struggled to deal with the changing nature of external threats to India’s security. Under successive coalition governments since mid-1990s, the foreign policy seemed to shape activities of RAW. On the other hand, Zia ul Haq pushed more money received from the US as security aid in return for Pakistan’s assistance against USSR’s intervention in AfPak region. The Central Intelligence Agency (CIA) trained ISI men drawn from Pakistan Army, Air Force and Navy. Pakistan used the American aid and training to launch a proxy war in Jammu and Kashmir unveiling its ‘thousand cuts’ terror policy. Experts believe that foreign policy instrument as defined in Gujaral Doctrine pushed RAW to the margins in security considerations. However, another setback in 1999 Kargil war gave a fresh lease of life to RAW. Under the Narendra Modi government with hawkish intelligence officer Ajit Doval as National Security Advisor, RAW is said to be gaining confidence and support of the Centre. 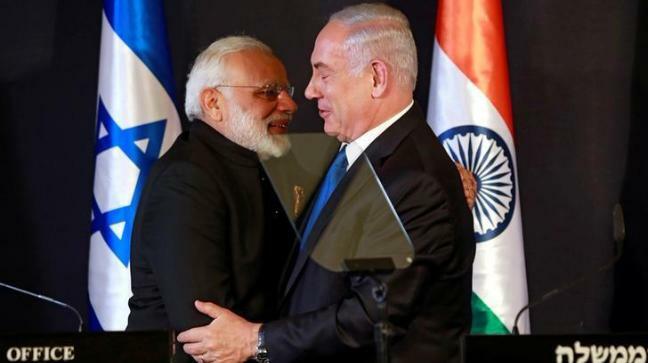 However collaboration with the Mossad got a boost in February 2014 when India and Israel signed three agreements including one for Cooperation in Homeland Security and Protection of Classified Material. Four high profile visits by the leaders of two countries have signaled a clear shift in India’s engagement with Israel. President Pranab Mukherjee visited Israel in 2015. It was the first ever Israel visit by an Indian President. Israeli President Reuven Rivlin visited India in December last year on a six-day tour. He became the second Israeli President to tour India after Ezer Weizman, who visited New Delhi n 1997. Narendra Modi visited Israel last year – the first by an Indian prime minister in 25 years. Benjamin Netanyahu is on a six-day visit to India. This is the first visit by an Israeli PM since 2003, when NDA under Atal Bihari Vajpayee was in power. In all these four meetings, India and Israel have agreed to deepen ties and enhance security cooperation through intelligence sharing, which effectively translates into collaboration between RAW and Mossad. But the question is, can Mossad help RAW neutralise ISI designs and its terror proteges?